A classic recipe, Biryani is a sumptuous dish of rice layered with lamb (or chicken), caramelized onions, saffron, herbs and clarified butter. It takes hours to cook, so it’s traditionally prepared with great love and care for weddings and other special occasions. 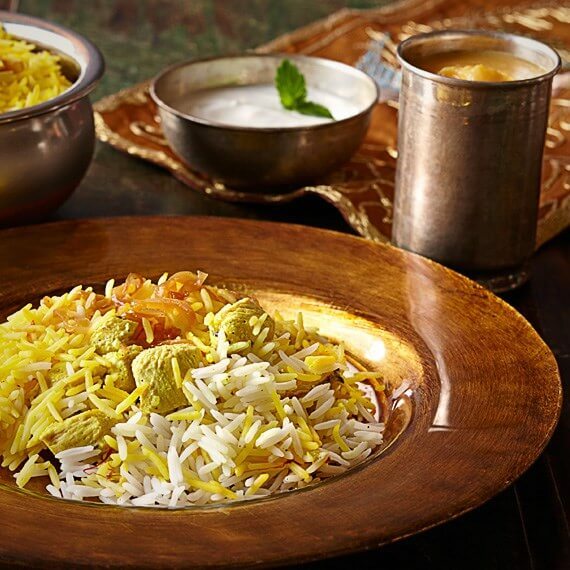 This simple recipe brings traditional biryani flavor while cutting down on the work. 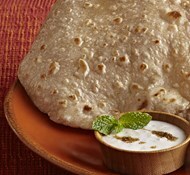 Try it for a special dinner and serve with yogurt or a tomato-onion raita. Place Daawat or Royal Chef’s Secret Sela Basmati Rice in a medium mixing bowl. Cover with water. Rinse rice well and add fresh water to cover. Stir in a pinch of salt and soak rice for 15 minutes, then drain well into a colander. Meanwhile, slice the onions extremely fine, using a sharp knife or mandolin. In a deep pot, heat 1½ cups clarified butter or 1½ cups oil-butter mixture for 1-2 minutes until almost smoking. Reduce heat to medium-low and add the finely sliced onions. Caramelize the onions, stirring often, 10-12 minutes. Stir constantly during the last two minutes to prevent the onions from burning. Once the onions are in the pot, bring 4 cups of water to a boil in another large pot. Stir in most of saffron strands, bay leaf and salt. When the water comes to a boil in 5-7 minutes, reduce the heat and remove the bay leaf. Gently stir in the soaked, drained rice. Cover and cook rice for 15 minutes until the grains are long and separate but still firm. Turn off the heat. Turn out the rice onto a baking sheet, run a fork through it to separate grains and set aside uncovered. When the onions are brown and crisp, turn off the heat. Drain the onions between two slotted spoons, squeezing out the extra clarified butter into the same pot. Place drained onions on a paper towel, leaving 1 spoonful in the pot. Turn the heat back on and add cumin seeds and turmeric. Stir well. Add garlic and ginger pastes. Sauté briefly. Add chicken chunks or meat to the onions. Raise the heat to high and sauté for 1-2 minutes. Stir in yogurt, cilantro, mint, 1 teaspoon salt, garam masala. Cook the chicken, stirring occasionally, until tender, 15 minutes. For meat, cook about 25 minutes until tender. Turn off the heat. In a wide mouthed, medium pot with metal handles and a tight fitting lid, spread the remaining clarified butter or butter. Layer the bottom of the pot an inch deep with the cooked Basmati. Lightly spread half the chicken/meat mixture and sauce over the rice. Lightly cover the meat with half the caramelized onions. Layer half the remaining rice over the onions. Spread the remaining of the chicken/meat and sauce over the rice. Cover with the rest of the rice and top with the caramelized onions. Make small holes in the top rice layer. Warm milk in a small pan or microwave (10 seconds) and add the remaining saffron to it to infuse it with flavor. Stir and pour the saffron milk into the holes in the rice. The milk will keep the rice moist and the saffron will infuse it with flavor. Cover the pot with aluminum foil and put the lid on tightly. The Biryani can be made up to 1 day ahead. Store in the refrigerator until an hour before serving. To serve the Biryani, heat it through in the oven or on the stovetop. Preheat oven to 300 degrees and put in the Biryani, tightly sealed. Bake for 20 minutes until it is hot. Bring the pot to the table and open it when all the diners are seated. They will smell the tantalizing aromas of Basmati, saffron, caramelized onions and meat when the lid is lifted and the aluminum removed. 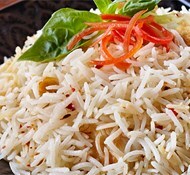 Dig through the layers to give each diner a serving with Basmati and meat. Leftover Biryani is delicious hot or cold.